We got ourselves a mystery here. 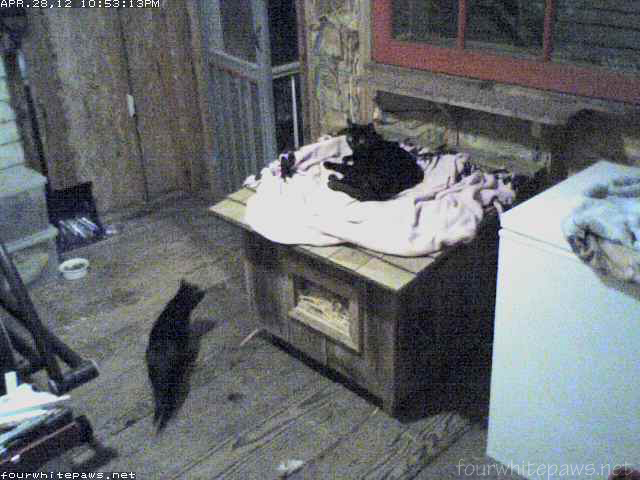 I was getting ready for bed and looked at the back porch camera and noticed there was a black kitty snoozing atop Oliver's guest house - nothing new there. I needed to lock the back door and hoped to turn off the light, so I went out to the mudroom to do so. The kitty didn't leave, it just watched me through the window in the door. Does this cat look ear-tipped to you? The cat's left ear looks slightly different than it's right ear, but it still looks rounded to me. The picture is blurry due to not being able to use the flash through the glass. 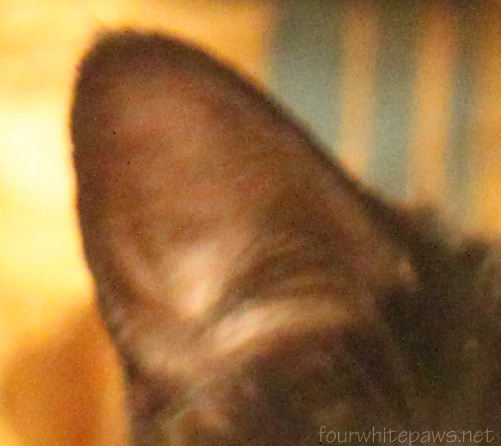 For comparison, here's the right ear zoomed in. I would think an ear tipped cat would be obviously ear tipped. 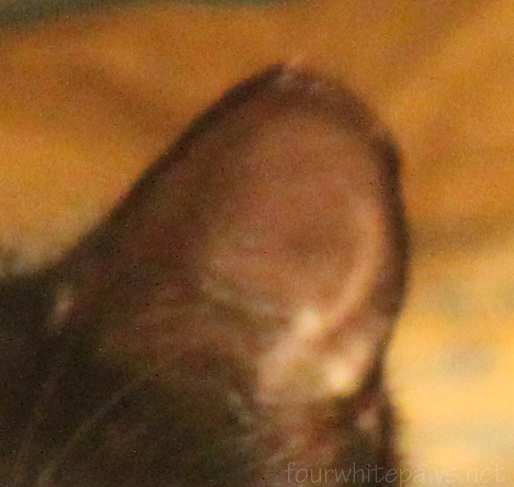 And this ear still looks a bit rounded on top and has a matching black border all around it's edge like the other ear. Oliver's three siblings were all ear tipped when they were neutered/spayed. And this guy is not Oliver but I know he is friends with Oliver. Just after taking the last picture, Oliver came onto the porch too and hung out. I also saw one of the ear tipped siblings (not MK) on the porch too. Could this is a different black cat with a white spot on it's chest who's also part of the Family?! Or maybe the TNR clinic only took off a tiny bit of it's ear? Oliver's not talking, so it remains a mystery. 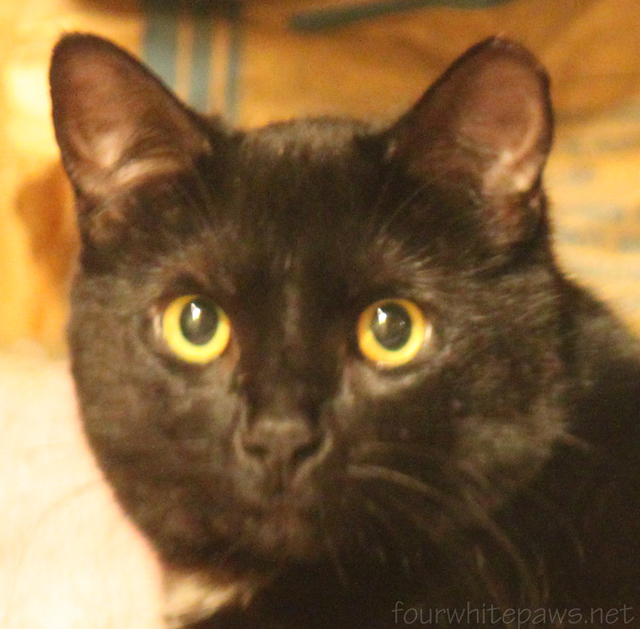 Let me know what you think, does this cat look ear tipped to you? Wow I think it's great that they feel comfortable enough in your presence. It does look tipped to me, if not then it has had a bit ripped off! I haven't seen a lot of ear-tipped cats in real life, mostly only in pics...I didn't think it looked tipped to me. I'm sure someone with TNR experience can give you a better idea, though! He may have had a serious tussle too...durned hard to tell. I don't think it was tipped unless someone did a poor job. Something obviously altered the ear, though. My brother Rushton had his ear docked and it's much, MUCH more obvious than that. The peep has told me that where she grew up - in North Western Ontario where it's super cold - sometimes cats' ears were rounded from being frost-bitten. Does it get super cold where you live? Thankfully, it does not get super cold here. We get an occasional cold night, but nothing really that crazy. It IS different, but don't the vets usually take a bit more off to prevent mysteries just like this? He's tipped, all right. Different vets take off different amounts. 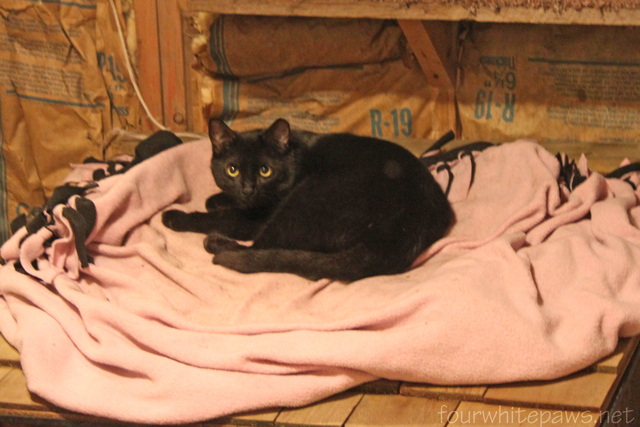 I had one feral who gave up nearly half his ear to the vet, and another whom I could barely tell had been tipped at all (but I know she got spayed!). could be, or it could be just the way the ear is sitting. It looks like that side muscle might be pulling the ear forward a bit which might be why it looks tipped. It looks kind of tipped...but very hard to tell. Maybe the vet can tell. You do have a mystery on your hands! I've never heard of ear tipping, even though I've had cats for about 30 years -- different one --so this is a whole new experience for me. I'm enjoying your blog. I think an ear tip is usually very obvious, people are supposed to be able to spot them easily. I think this one is too subtle for a tip. The ear thing is much ado about nothing, methinks. Long ago "MK" showed up in your backyard with TWO small kittens. Later, the one kitten was not seen again. Is this that missing kitten? Hard to tell ...... it could be a tip or a nip......? We agree with Cat. 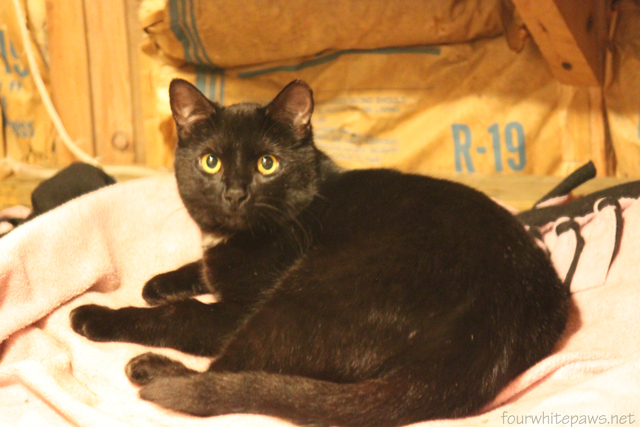 At the cat sanctuary where our human staff volunteers, tipped cats have an obvious mark at the tip of the ear. I don't know about the ear - it doesn't look like a tip to me, but we don't ear tip our ferals because we don't have any vets that can do it well. It is obvious to me though that some how the word has gotten out on the street that you have a cool porch for cats to hang at. Maybe Oliver is spreading the word? I'm coming in late to this, but I honestly think it is tipped - and that is because I know of one vet who hated to do the ear tips, so she worked to make them minimal. She has been trained now to make them more obvious, but since she has altered MANY of the ferals in Phil's neighborhood, I'm voting on tipped. fair sun, where art thou?